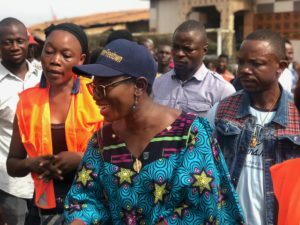 Throughout the weekend, Mayor Yvonne Aki-Sawyerr and a small team from the Freetown City Council continued their efforts to resettle members of the Kroo Bay & Susan’s Bay Communities that were affected by fire disasters two weeks ago. On Saturday, the Mayor shared the Council’s short and long term plans to over 400 households that were affected in both Kroo Bay and Susan’s Bay, and the donation of shelter kits to residents of Kroo Bay started on Sunday, in collaboration with CRS, Concern & ONS. The Mayor revealed that in the short term, Freetown City Council’s partners, CRS & Concern, are providing shelter kits for residents rebuild their homes. She emphasized that the safety of the affected residents and the reconstruction of all homes is of utmost importance to the Freetown City Council. At Kroo Bay, the Mayor explained that the reconstruction will last a few weeks because the Council and its partners, including the Office of National Security, want the process to be as orderly as possible. “You have been divided into groups and each group has been given a specific time to be verified and to collect their shelter kits. Do not come for your materials when it is not your turn. When it is your turn, please show up and show up on time. We do not want any excuses,” urged the Mayor. As the Mayor rounded up, she emphasized that the Council wants better for the community and from the community, especially on the issue of sanitation. She cited the example of a major drainage that passes through the community, which the Council had spent resources to clean up a few months ago but was now full of rubbish. “We will engage the people living where the drainage begins and put measures in place to stop them from dumping garbage in the drainage but I know that you also dump your garbage in that drainage. When I was here earlier in the week, I challenged you all to save money towards hiring waste collectors. The money you spend on curing malaria, typhoid, dysentery is far more than the money you will use to properly dispose of your waste.” She, however, promised to look into clearing it again before the rainy season starts to prevent flooding. The communities were grateful for the fact that they were a priority to the Mayor and several individuals thanked the Mayor for the relief items as she interacted with them. Community representatives also addressed their fellow residents and encouraged them to report illegal electricity connections, which is the most common cause of fires in informal settlements like Kroo Bay and Susan’s Bay. The distribution of the kits, which include zinc sheets, nails, cement , sand, sticks, and granite stones, started on Sunday at Kroo Bay. 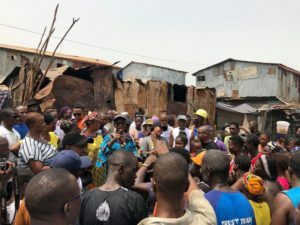 With great help from Councillor Murray Alie Conteh and the Community Disaster Management Committee, who mobilized other members of the community to carry materials, the Freetown City Council ensured that the first set of relief items were safely delivered to the site of the fire incident. The details of the distribution of kits at Susan’s Bay are still being finalized.